Civil-society satellites are said to have aided an International Criminal Court prosecution. So reports Time magazine in an article entitled "George Clooney's Satellites Build a Case Against an Alleged War Criminal." Keeping eyes on developments in Sudan for the last 12 months has been, as we posted when it launched, the Satellite Sentinel Project. Started to monitor the referendum that led to establishment of South Sudan as the newest U.N. member state, this past year the Project has posted aerial images of violence in the Sudan region. (credit for detail at right, from a Project array of before-and-after photos, dated June to August 2011, and captioned "Apparent mass grave below Kadugli welcome sign: Kadugli, The Town of Love and Peace") The Project has tweeted and retweeted Sudan news, and has released findings to the media. And, it appears, to the ICC. Time reporter Mark Benjamin reported that he'd obtained an "internal ICC investigation division memo" indicating that "a significant portion" of the ICC's investigation against its newest suspect "is based on data from the Satellite Sentinel Project." The newest suspect is Sudan's Defence Minister, Abdel Rahim Muhammad Hussein, against whom ICC Prosecutor Luis Moreno Ocampo sought an arrest warrant last Friday. Should the Pre-Trial Chamber grant the request, Hussein would join Sudan's incumbent President Omar al-Bashir as an accused-at-large. (The ex-head of state of Côte d'Ivoire made his 1st appearance before the ICC yesterday, even as developments in Kenya indicated a shrinking of the range in which Bashir may roam.) The Defence Minister is alleged to have ordered security forces to attack Darfuri civilians. Something's curious about Benjamin's story, however: the charged attacks occurred in 2003 and 2004. That's years before the Satellite Sentinel Project began. 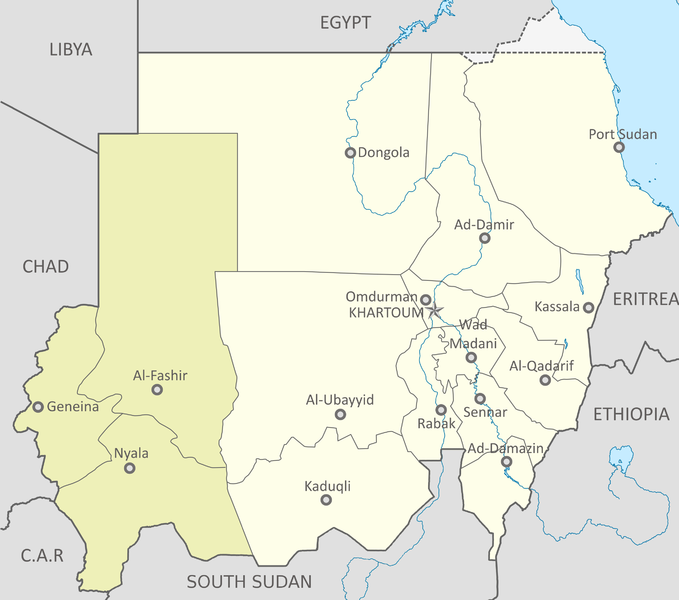 As indicated by the Kadugli photo above, moreover, the Project's focus is on developments in the south, while the region of Darfur, in yellow below, extends south and north along Sudan's western border. (map credit) It was events in Darfur, from 2002 onward, that prompted the UN. 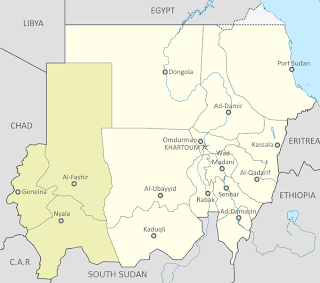 Security Council, in Resolution 1593 (2005), to refer the situation in Darfur to the ICC. The fact that the ICC is investigating Hussein's role in possible atrocities in the South does not necessarily mean he will face arrest for any actions there. Keep looking to see if the Sentinel Project's eyes-in-the-skies images surface in an actual ICC proceeding -- and if so, how issues regarding the data are litigated. The author appears to have gotten some rather basic facts wrong. Presumably the author is aware that Darfur, even the area in "yellow" has always been and remains in Sudan. Presumably the author is also aware that Kadugli is and has always been in Sudan. Neither of the areas the author discusses are in the "South". The Sentinel's project focuses on the Southern border of Sudan with spillover into relevant Northern areas of South Sudan not the "South" which presumably the author is aware refers to the Republic of South Sudan. Hi, I'm not sure which author you mean, me as the author of this post or Benjamin as the author of the Time article. But perhaps the problem is that I did not phrase well. Yes, Darfur is part of Sudan, but it does also run north to south along (perhaps "within" would have been a better word). And yes, Kadugli remains within the borders of Sudan -- but now that South Sudan is an independent state, it is in the south of Sudan, which is the point the post meant to say. So I think we agree on the geography but perhaps not the best way to describe it.